Outgoing postcard US-3841683 traveling to Czech Republic, shows a pink elephant in front of the Diamond Inn Motel on the Las Vegas Strip across from Mandalay Bay Hotel. Built in 1940s, the motel was originally called the Desert Isle. The ceramic elephant came from Disney World in the 1950s. The courtyard style motor lodge offers older rooms but one of the least expensive room rates on the Las Vegas Strip. I took this photo on October 14, 2015 when I got myself familiar with the Rock 'n' Roll Las Vegas Marathon routes. The starting line was less than 100 feet or 30 meters away to the south. There is a Pink Elephant Car Wash in Seattle. 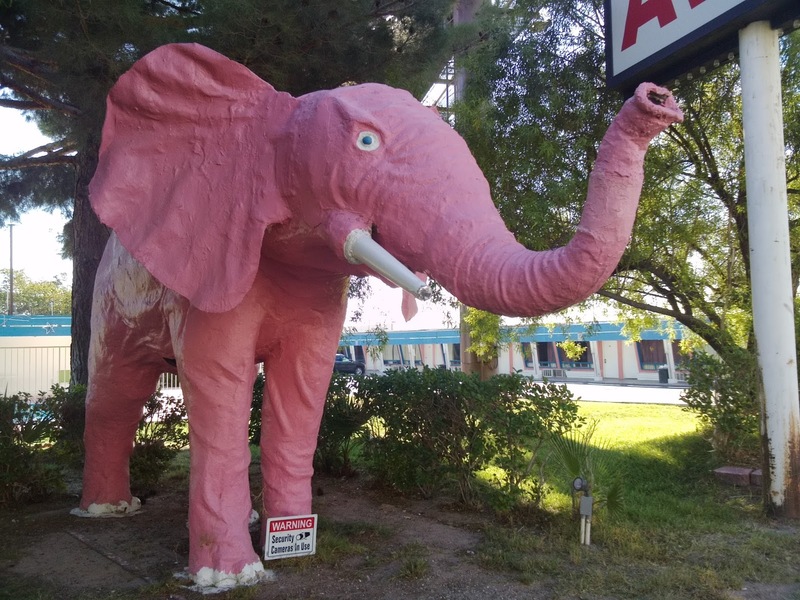 Here are several phases relating to "elephant:"
A "pink elephant" is a hallucination seen by drunk people.